when I try to run at borland 5.02, it say "#error BGI graphics not supported under Windows"
what the function of "c:turboc3bgi"? It is the path of the bgi folder which contains the necessary files to run graphics program. This is different for different compilers, just change path "c:turboc3bgi" to correct bgi folder path and the error will be removed. If you have further queries than let me know. this program doesn’t execute it shows error in the initgraph(&gdriver,&gmode,”c:\turboc3\bgi”); part. Which compiler you are using? it will work only in turbo C++. I am using Turbo C++ 4.5 in Windows 7 and whenever I tried to run this program, it said "BGI Graphics not supported under Windows". What should I do? And than try to run the program, it will definitely work, as i am also using the same compiler in my computer. I hope this will help you. This is way more helpful than anytihng else I’ve looked at. Yes you are right bro, this will not work in linux as GCC does not have dos.h and conio.h. You can try there alternatives by searching on google. I can't help you in this case because i have very less experience of working on GCC. where sould I put the EGAVGA.BGI lib to in visual studio 2012 , win 7 ? i want to know that why did you mentioned your email without any fear of spam? there is no need to worry about this as my email is also mentioned on the contact us page of this blog. when i get C++ in full version for window 7 ? who know what is that? It is the path of the bgi folder which contains the necessary files to run graphics program. can someone explain me the car program????? awesome ….I will try …..and definetly say …that what happens…..
Hi, it’s interesting to see that someone has so much love for programming. Keep up the good work. 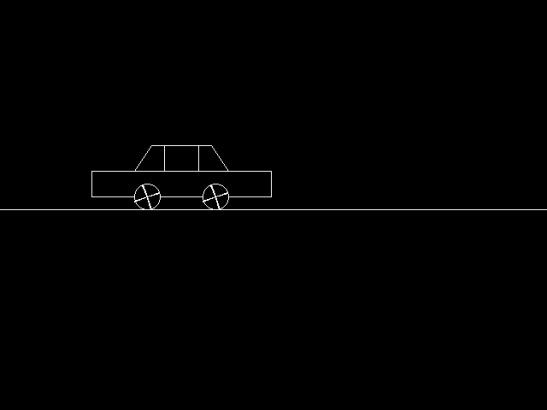 By the way, can your code make the car move? Have you also implemented similar program in Java? It not Run! I Can’t RUN with my Turmbo C++ . why brother please tel me ? how can use cleardevice() in java???? Hello Neeraj, I am using DOSBox 0.74. It is showing error that undefined symbol circle,initgraph,clear device,line,pieslice and close graph. Please help to remove these errors..Please reply. While compiling ds program it shows “code has no effect”. Hello sir my program is run. But show graphics not initialized (use ‘init graph’). Can anybody explain it how it works and how to remember it all.